Soils in the B&B Complex are mostly derived from waethered volcanic bedrock or volcanic ash and pumice (CITE). During a wildfire surface soils can approach temperatures of 1652° F. (Ice et al In Press: 2), however dry soil does not conduct heat well and temperatures may be cool enough just inches below the surface that burrowing animals may survive. Effects on soil from wildfire can include "exposed mineral soil, nutrient transformations, ash accumulations, near-surface soil particles bereft of binding organics, and water repellency" (ibid: 2). Soils are particularly vulnerable in a burned landscape (Beschta et al 1995: 8). Light surface fires can increase the availability of nitrogen in the soil in the short-term, but the element is lost within a year through leaching and erosion. Nitrogen losses from intense fires can have dramatic effects on forest productivity. The weather for the B&B Complex study area is highly seasonal and heavily influenced by local topography (Taylor and Hatton 1999). According to scientists, "wildfire can cause water repellency and consume plant canopy, surface plants and litter, and structure enhancing organics within soil. Changes in soil moisture, structure, and infiltration can accelerate surface runoff, erosion, sediment transport and deposition" (Ice et al In Press: 1). 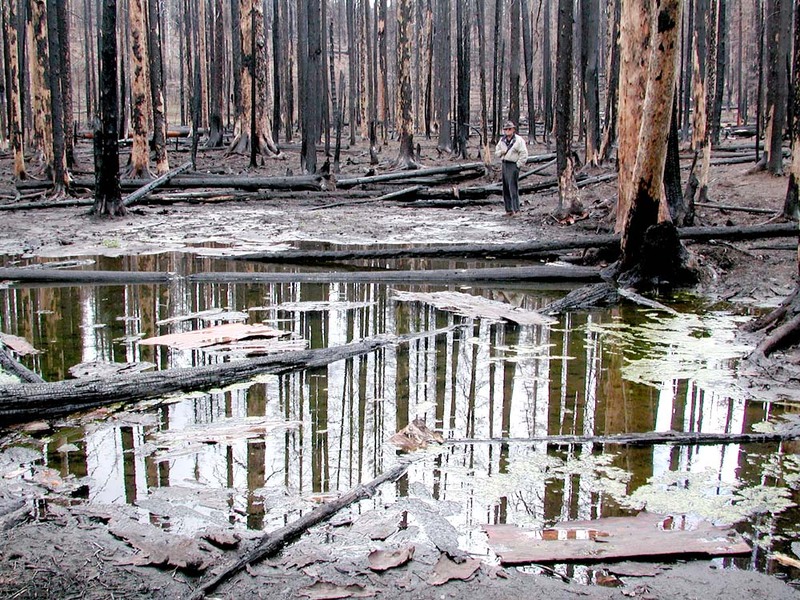 Poor timber salvage practices following a wildfire can also lead to increased surface runoff and soil erosion. However, using full suspension cable systems or helicopters on steep slopes, implementing skidders on snow instead of bare dirt, and treating the area after the salvage are a few of the ways that erosion can be minimized (CITE). Wildfire events can affect water by increasing stream temperatures and nutrient concentrations. Both of these effects can increase aquatic mortality, however, there is also evidence that while "post-fire runoff and sediment can have immediate impacts on water quality and existing channel features, they can also have a role in the long-term maintenance of desirable fish habitat downstream (Ice et al In Press: 9)."